Mirrors are one of the most important accessories in any bathroom. Once neglected fixtures, today, they have become the focal point in any bathroom and can make a small one look bigger and more stylish. They reflect light and enhance the contemporary or traditional decoration of the bathroom. The first question you have to ask when choosing a mirror is how large does it need to be? At a minimum size, it should be enough to see your face for applying mak-up, shaving, brushing teeth or doing your hair. Some people are happy for tiny mirrors with a magnifying side if they have little wall space. This is often the situation when a wash basin is positioned below a window, a common situation in many British homes and may be difficult to move to another part of the bathroom. Small mirrors also don’t require so much cleaning and polishing. But in most cases, people prefer a bathroom mirror large enough to allow two people to use it at the same time. They also enjoy that spacious feel a mirror gives to a bathroom. In these cases, the mirror has to be positioned so that it reflects natural light from the window onto the walls. Storage space is always precious. 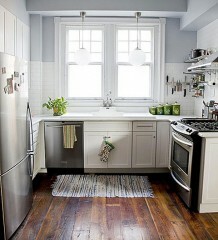 This is when a mirror fronted cabinet becomes an ideal solution. It can look smooth but opens into a narrow cabinet that can store extra toiletries, cleaning goods and even medicines. These types of mirrors are usually the biggest space savers and are popular with those people who have very small bathrooms. But in large bathrooms, cabinet mirrors can almost be like small cupboards with a full length front glass and a cupboard that can store towels and bath robes. Bathroom mirrors are no longer just for looking at your reflection. Think about adding TV monitors or even surfing the internet during your morning routine. Choosing a fog free mirror has become very popular as people become fed up of cleaning up misted glass every time they have a shower. Try placing lights around the mirror for that spectacular extra. This will not need expensive rewiring. A mirror can be enhanced with battery-powered, coloured LED lights. 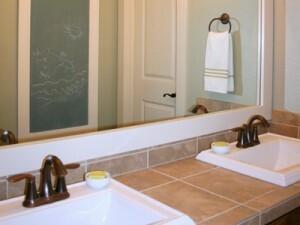 Mirrors are essential components of any bathroom. They add style and space and can provide some useful storage solutions. Mirrors come in a wide price range that is affordable and can enhance all bathrooms in the UK. Alice Aires is a mirror designer. She became interested in this craft 10 years ago after visiting a glass workshop in Venice. See the website bathandshower.com for more ideas about mirrors in the bathroom.